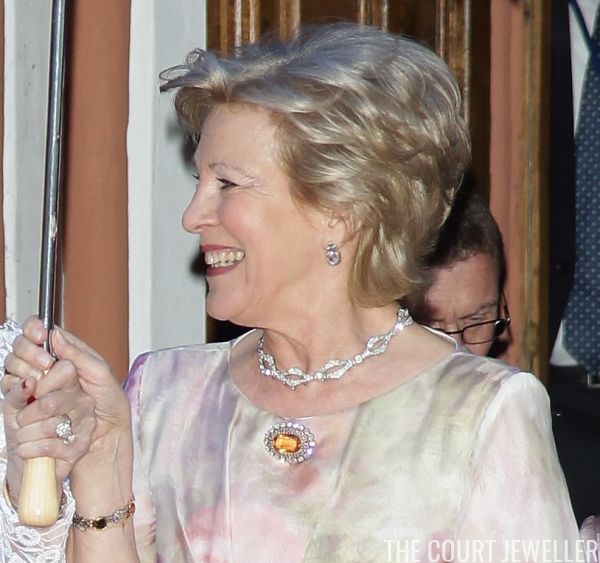 Anne-Marie, the former Queen of Greece, has a jewel collection that any of us would envy. That's, in part, because she was born into one royal family and married into another. 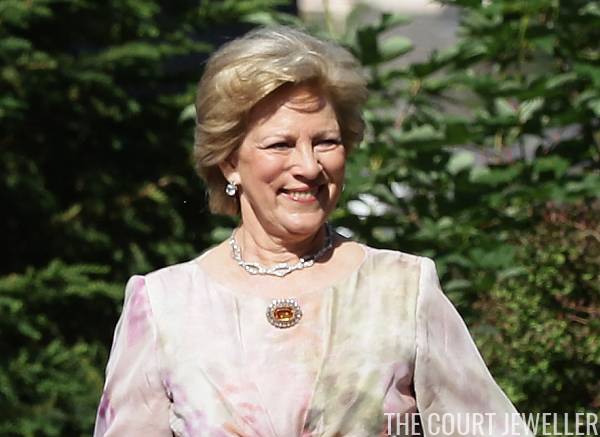 Today, we're looking at an heirloom that comes from her mother, Queen Ingrid of Denmark: the topaz cluster brooch. The brooch features a large, oval-shaped topaz with a deep yellow hue. The gemstone is surrounded by three rows of diamonds. The brooch can be worn either with or without a pear-shaped pearl drop pendant. And it can be worn either horizontally or vertically, because it has hooks to attach the pendant on both the long and short ends of the oval. In his book on Denmark's royal jewels, Bjarne Steen Jensen explains that the piece originally comes from Germany. 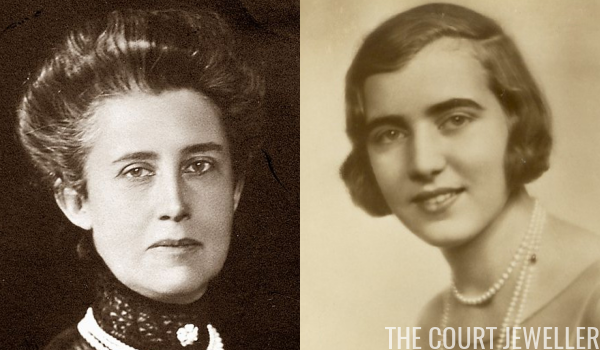 In 1935, Queen Ingrid of Denmark (then Princess Ingrid of Sweden) received the jewel as a wedding present from her great-aunt, Grand Duchess Hilda of Baden. (Hilda's late husband, Grand Duke Friedrich II of Baden, was the brother of Ingrid's grandmother, Queen Victoria of Sweden.) Hilda didn't attend the wedding, but she apparently sent along this piece to mark her great-niece's marriage to the future Danish king. Jensen also assumes that the brooch must be a Baden family piece. He bases this belief on the fact that Grand Duchess Hilda didn't have any children -- therefore, she must have given a piece of family jewelry to Ingrid. (This is possible, but it's not necessarily true.) 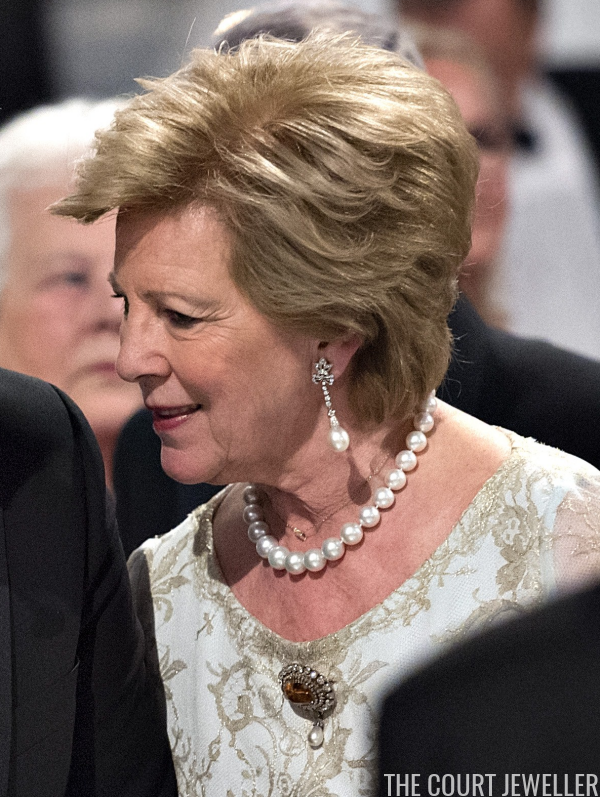 He speculates further that the brooch could have belonged to Grand Duchess Louise of Baden (Hilda's mother-in-law and Ingrid's great-grandmother) or even Grand Duchess Sophie of Baden (Ingrid's great-great-grandmother, who was born a Swedish princess). Ultimately, I don't think we know for sure. 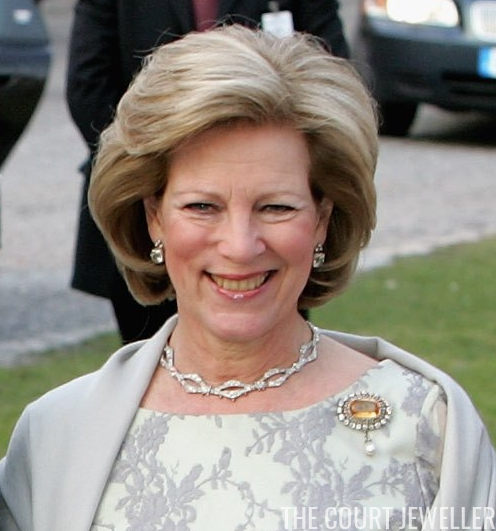 What we do know, however, is that Queen Anne-Marie inherited the brooch from her mother. 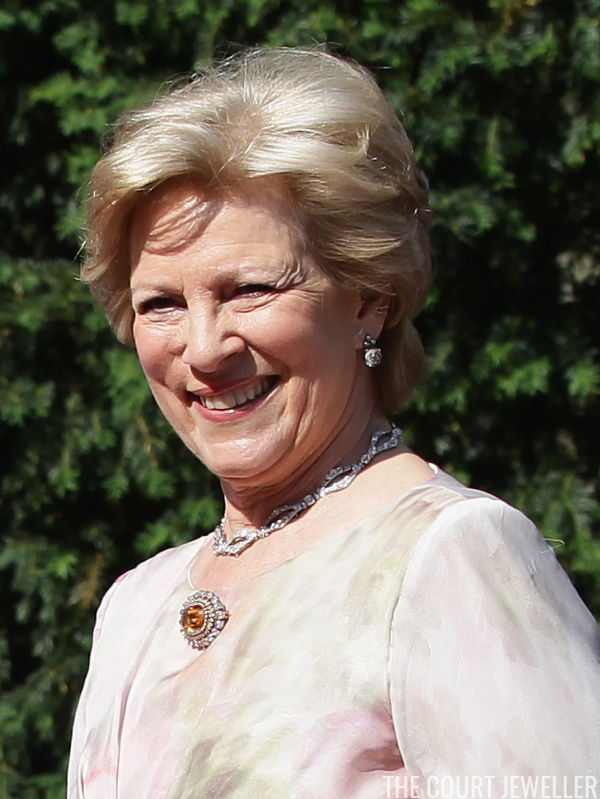 She wears it quite frequently at major occasions now, including the 60th birthday of her cousin, King Carl XVI Gustaf of Sweden, and the wedding of her niece, Nathalie of Sayn-Wittgenstein-Berleburg. Anne-Marie generally wears it horizontally, both with and without the pearl pendant.